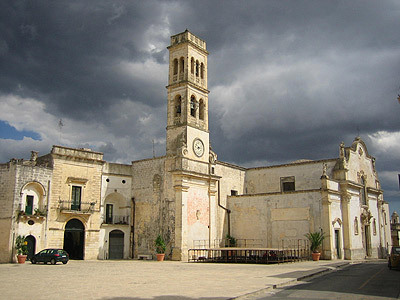 Specchia is a little Salento centre, positioned on a small hill dominating the Serra dei Peccatori. Its name derives from an accumulation of stones dating back to the Iron Age, which were used by the Messapians as lookout and defence stations. Its origins came about due to continuous Saracen raids along the nearby coast (IX and I Centuries), which pushed the inhabitants to move inland and on the hill, given birth to the habitation of Specchia. With the advent of the Normans, the suburb became part of the Earldom of Lecce and was given in fief to Filiberto Monteroni (1190). After the decline of the Angiò in Italy (1269) which cancelled the Swabian lineage from history, Specchia was given to Rodolfo D’Alnay, already a noble of Alessano. It then passed to the Del Balzo Family, in marriage dowry for Caterina D’Alnay (1325). A century later (1434), under their guidance, Specchia was besieged and destroyed by Giacomo Caldora, a cavalier under orders from Giovanna II of Naples. A few years later (1452), Alfonso I of Aragona gave permission to Raimondo Del Balzo to build and repopulate the suburb. In 1480, after the Turks took Otranto, Specchia became a secure refuge for many people from Salento, therefore furthering its growth. During successive centuries, the City became a fief of the Di Capua, Gonzaga, Brajda, Trane, Protonobilissimo families, the latter then kept it from 1630 to 1794, when the King of Naples made it part of the Demanio Regio (Royal government property).. In 1797, it was given to Antonio Maria Pignatelli who kept it until the abolition of feudal rights law (1806). In 1861 it was annexed to the Reign of Italy after a plebiscitary vote on 21st October 1860, which sanctioned the wishes of the people of Puglia to enter into the new reign. A visit to the City is full of fascination and evocative ideas from the beauty of its historical centre which conserves an intact Medieval town planning (XV Century). The Risolo Castle dominates the centre made up of a narrow streets, steps, small courtyards and Baroque doorways. The Franciscan Church and Convent (1531), the Parrocchiale (Parish Church) (1605) and the S. Nicola Church (IX Century) are the main religious buildings in Specchia.